Those who have read Alice in Wonderland may know the Cheshire Cat as a mysterious and baffling being. The Cat often makes some very good points, although rarely in a very helpful way. One is in the picture below. Unfortunately, I took it with my phone, and the text is a little blurry. So I re-wrote it. “That depends a great deal on where you want to go” said the Cat. “I don’t much care where ___” said Alice. 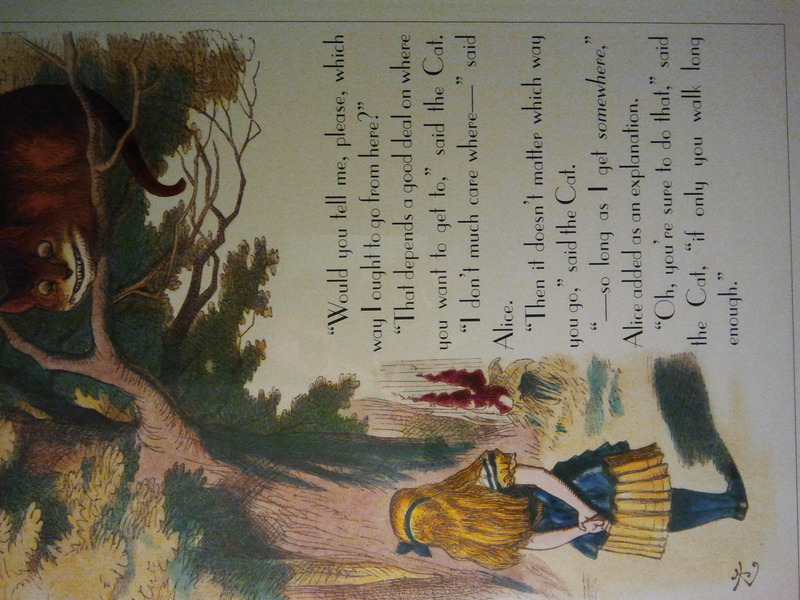 “__ so long as I get somewhere,” Alice added as an explanation. If you are reading this blog post, chances are you are interested in financial planning. Alice has taken the first step: she knows she would like to get somewhere, she realizes that she does not know how to, and she has asked for advice. Hopefully in real life you won’t have to rely on the Cheshire Cat for advice, or any Cat for that matter! Do remember though: if you walk long enough, you will eventually get somewhere. Will it be where you want to?